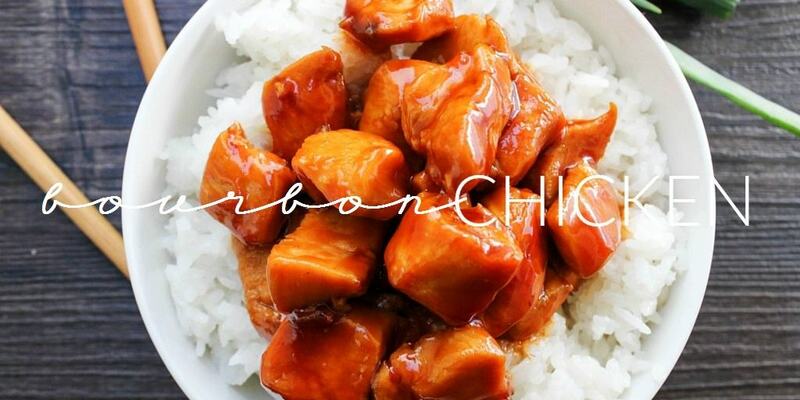 Bourbon Chicken is my favorite easy dinnertime meal. Served with rice, green onions, and lots of sauce, this meal is delicious and ready in just 30 minutes. This recipe actually isn’t made with bourbon, although it was given that name because it can be made with bourbon, the recipe was created by a chef who worked on Bourbon Street. It is typically found in Cajun-Chinese themed restaurants. While many recipes I had this for the first time in Boston and after coming home from the trip, I had to find the nearest place that made it – thank goodness there was in our local food court mall. When it closed down and was replaced with a pizza place I was super sad, honestly it was the only reason I went to the mall. So that is when I was on the search for a recipe that was just like the one I adored. My kids love this as well, but with lots of sauce. They have good taste. I literally lick the skillet clean every time, I love the sauce that much. I made a note at the bottom of the recipe that I would double the sauce recipe because it is that good. Try it, you will love it. And you can never go wrong with extra sauce. Skip the take-out and make this simple, easy, and delicious recipe that only takes 30-minutes! Friends you are only a few ingredients away from the best chicken ever. 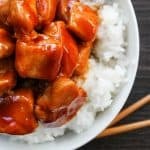 How do you make Bourbon Chicken? Heat a large skillet heat oil over medium-high heat. Gently season the chicken with salt to your taste and add chicken pieces. Turn and cook for 5 minutes or until chicken is cooked on all the sides. Remove the chicken and add the remaining ingredients: garlic, ginger, red pepper flakes, apple juice, apple cider vinegar, brown sugar, water, ketchup, soy sauce and cornstarch. Stir together over the heat until it is well combined and cornstarch and sugar have dissolved. Add the chicken back in and bring to a rolling boil. Reduce heat to low to medium-low and simmer, uncovered for 20 minutes. Serve over hot rice. Enjoy! NOTE: We like a lot of sauce, so I double the sauce so that my kids can drench their rice in the sauce. Try these other delicious chicken recipes: Slow Cooker Chipotle Barbecue Chicken, Maple Barbecue Chicken Kabobs, Baked Sweet and Sour Chicken. Don’t forget to pin this to your favorite Pinterest board to make later. Recipe Note we like a lot of sauce, so I will double the sauce ingredients so that my kids can drench their rice in the sauce. So did you swap out the bourbon for apple juice? Thanks! oh wow that looks so so good! Thank you for the lovely recipe and Happy Valentine Day. This looks amazing & so quick! Added to my menu for my family this week! Curious to know if you’ve tried making a double portion of the chicken and sauce to put halfway away for the freezer? Seems like it would freeze and thaw pretty well and just need to be reheated and served over rice…? I make this every so often. We LOVE IT; it is DELICIOUS. You are absolutely right about the sauce.